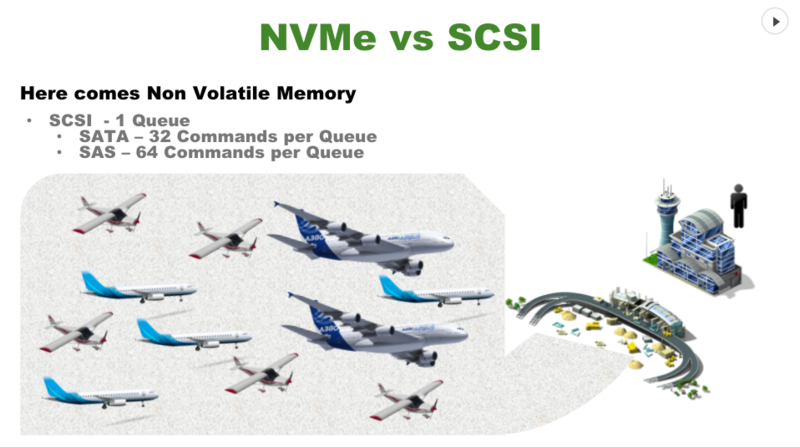 So what’s the difference between NVMe & SCSI? First, let’s look at traditional spinning disk. SCSI provides 1 queue. During the presentation I leveraged the concepts from Dr. J’s article and used the analogy of an airport with three runways. There’s one air traffic control that can only focus on one runway at a time, essentially wearing blinkers. This represents the queue only being able to process one transaction at a time. The runway length represents different areas on the disk platter. While a plane is landing and taxiing along the runway all other planes waiting to land will be held in a holding pattern. Next up was looking at Non-Volatile Memory still using SCSI. The commands per queue are still the same. In this case the runways have been replaced with a gigantic car park. There’s still only one controller acting as the queue but because there’s no runways it’s much faster to process each plane landing. It does take a lap of faith to think vertical landing is possible for all plane, ala Harrier Jump Jets. 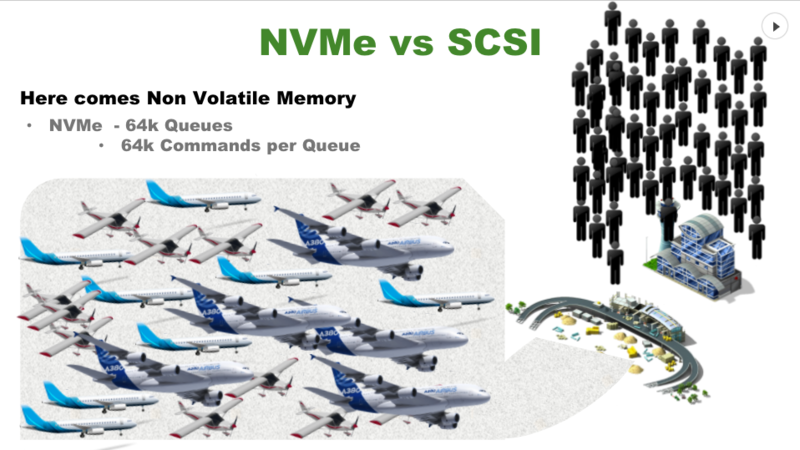 So what about Non-Volatile Memory with NVMe? Well now we have 64,000 queues with 64,000 commands per queue. Following on the from example it basically provides 64,000 traffic controllers to handle the number of planes that need to land so basically everything just drops out of the sky is one gigantic batch. During the presentation we also touched on NVMe over Fabrics. 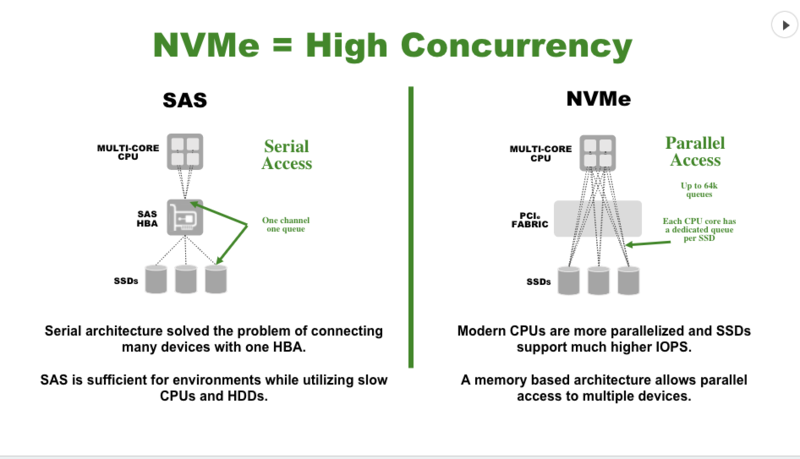 This was a focus for Craig and I honestly can’t do it justice here so I’d recommend returning to the guru, Dr. J Metz who has put together an absolutely awesome Program of Study on NVMe which also covers the NVMe over Fabrics concepts. 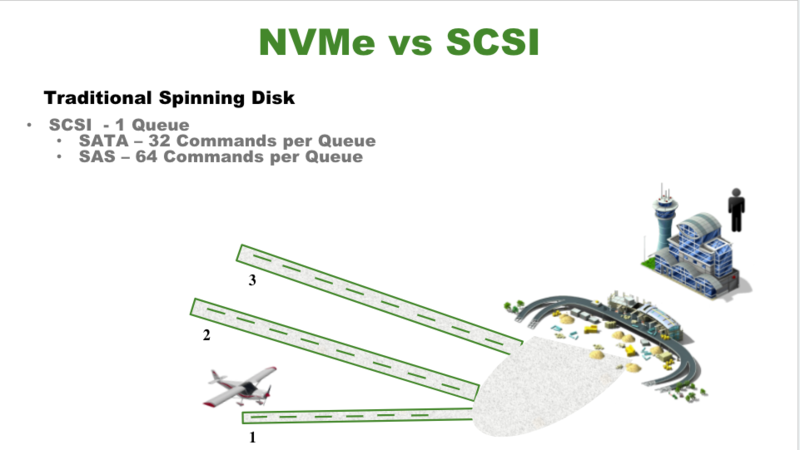 I recommend that if you want to learn more about NVMe work through his study plan. Each part builds upon the knowledge imparted in the previous one. So just to briefly wrap up what are the advantages of NVMe? This entry was posted in Blog, Community, Storage, VMUG and tagged Community, nvme, presentation, storage, vcommunity, VMUG. Bookmark the permalink.